I LOVE Jennifer Weiner. I follow her on Facebook, Twitter and Instagram. She totally cracks me up, and I've read a few of her books in the past that I really enjoyed. 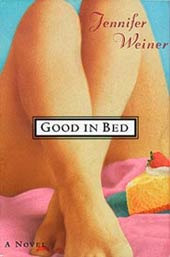 Netgalley gave me the opportunity to read her first book...the one that started it all...Good In Bed. This is Chick Lit in all it's luscious glory, and I see nothing wrong with that. I couldn't wait to see how much she's grown in her time as an author...so I jumped at the chance to get my hands on a copy. Thanks again Netgalley!! Cannie Shapiro is a smart, sassy and successful woman who just happens to be a size 16. She has a great support system...good friends, a fabulous rat terrier named Nifkin, a loving mother (who came out as a lesbian a couple of years ago), etc. But her whole life is turned upside down when her ex-boyfriend writes an article in a national magazine about "Loving a Larger Woman". This causes her to go into a bit of a spiral...not exactly downward, but kind-of all over the place. 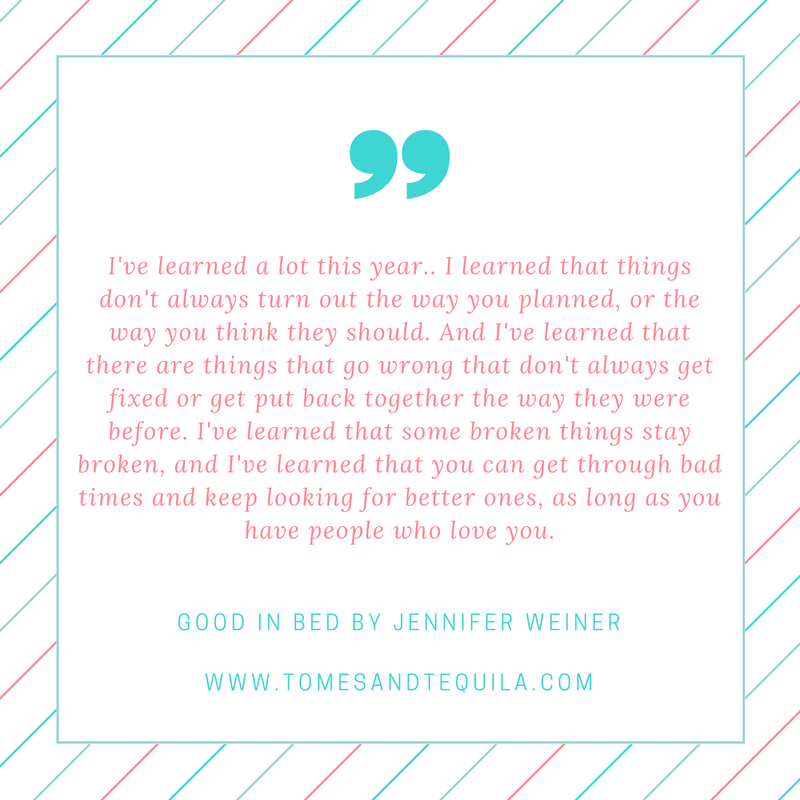 Good In Bed chronicles a crazy year in her life. I really enjoyed this book, and gave it 4 stars on Goodreads. Initially I thought this was just going to be a feel good whirlwind girl loses weight and gets back man story, but it proved more complicated than that. First off...as someone who is plus size and larger than a size 16...I can not even IMAGINE having an ex write something like hers did. I would have freaked the f**k out!! I could feel myself getting all worked up for her as I was reading it. To have your personal life put out there for everyone to consume would be wretched because even though he only used her initial, everyone who knew the two of them were together would know he was writing about her. It makes me feel bad for celebrities whose every move is documented. That can't be fun. And I just have to say, I am so glad that Jennifer Weiner didn't make Cannie a plus sized cliche. Cannie is active. She walks, she rides her bike...she takes care of herself. Yes, she has self-esteem problems, a lot of them stemming from her childhood and a horrible relationship with her father. But I never felt like this was a fat girl parody. I have read a few other books with plus size main characters, and they usually leave me with a bad taste in my mouth...but not this one. Yes, there is a section in the book that I think suspends belief a tad. Cannie goes to New York to interview an actress who happens to be her idol...and they spend an entire day together and become the best of friends...to the point where she moves in with her in California for a bit. Call me slightly cynical, but I don't imagine that happens often in real life. In short, I honestly thought this was just going to be a fluffy classic chic lit book, but it actually went a lot deeper than I expected. There is a point near the end of the book where the story takes a turn I wasn't expecting...and it made me reevaluate my feelings. 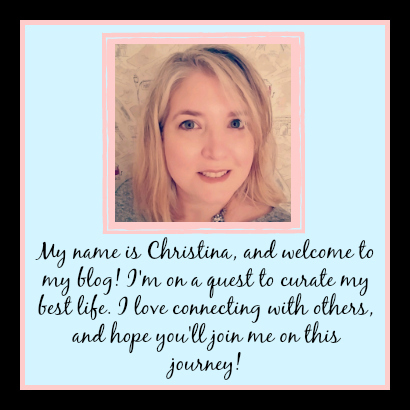 This isn't just a quick read girlie story. I think it has a lot more to it than that so I think it would make a good book club selection. It's not too long for the ladies who aren't readers. It's not too complicated to make reading it a chore. But there are plenty of conversation topics that would be intriguing to get into with other women. Depression, weight, parenthood, relationships, friendship, etc. You can see Jennifer Weiner's growth as an author, between this and her newer books. I think she writes a lot about what she knows...and at the end of this anniversary edition she talks about the real life story that led to her writing Good In Bed, and her struggle to get it published. She makes me laugh, and I'll continue to add her books to my To Read List. I can't wait to read her Memoir and Children's book that just came out. 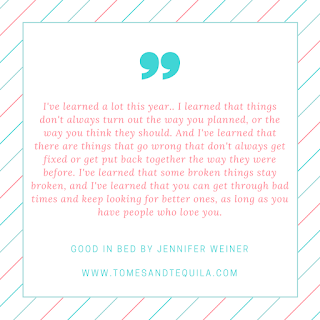 So...are you a fan of Jennifer Weiner? Did you read Good in Bed when it first came out? Like me, do you enjoy reading a light and fluffy book every once in awhile? Let me know in the comments or over on my Facebook page!